Last year I only just started to discover essential oils, I got really into my Monoibody oil but I also discovered the Feather & Down pillow spray which to this day I am still obsessed with. 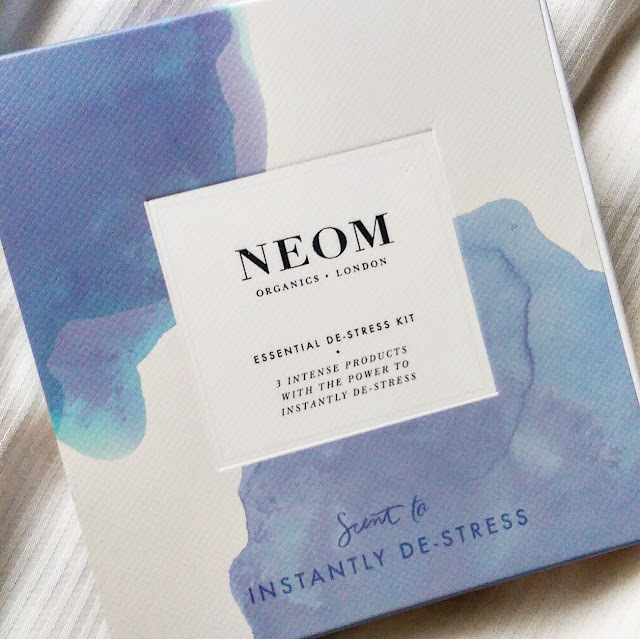 I recently stumbled across this gorgeous little Neom Essential De-Stress Kit and I am so glad I did. I'll be honest with you I have never tried anything from Neom before but have heard great things and I was in my local Homesense and spied this among a range of candles and I literally gasped when I saw it because I knew it was a good brand. Homesense had only two options one was the Essential De-Stress Kit and the other was Essential Energy Boosting kit and I nearly bought them but until I realised I was being a little impulsive so I opted for the De-stress Kit. I still have a lot going on with the new job and the house (or lack there of) so my sleep is very fragmented lately so I thought when I go to bed before I start reading this would be a great way to just unwind a little. Another bonus is this was only £12 in Home Sense when they normally retail for around £20. The thing I love about this little set is that it's an easy 3 step process, which only take like 5 mins which is not time at all, everyone has at least 5 minutes in their day free. The first little spray is for fabric so you can give a little spritz to something underneath or near your head like cushion. The second step is a little roller ball that you apply to the pulse points on your wrists, temples and behind your ears. Then finally you have the "on the go" mist that you spray above your head whilst talking a few slow deep breathes. You can either use the set in this format or mix it up a little, you might want to keep the roller ball in your bag so during the day you can try and steal moment of calm. The essential oils in this kit are predominantly are lavender, jasmine and Brazillian rosewood and I must say that if you dislike lavender then this is not a scent for you because it is quite intense. I have been using this product for a little while now and I must admit I quite enjoy the routine of doing this before I start reading at night, it does make me feel quite relaxed and calm. I do think it's a lovely product, but I feel like it's a little pricey to be something I buy frequently, I think its great as a gift or a treat! I'm definitely going to continue exploring more essential oils though because I think they are fab! Do you use scents to help you de-stress or unwind?